Vizag Steel Plant Recruitment 2018 – Apply Online for 72 Management Trainee Posts :- Rashtriya Ispat Nigam Limited, Vizag Steel Plant, Visakhapatnam has issued notification for the recruitment of 72 posts of Management Trainees (Technical) through GATE 2018. Interested & eligible candidates can apply online through official website of Vizag Steel Plant. Online Application Process has started from 16/01/2018 and the last date for submission of online application is 14/02/2018. Age Limit : 27 years as on 01/11/2017. Educational Qualification: Full – time Bachelorâ€™s Degree in Engineering or Technology in Electrical / Mechanical / Metallurgy disciplines from a University/ Deemed to be University / Institute of National Importance, recognized by AICTE with minimum 60% of marks in the aggregate of all years / semesters and all subjects (50% in aggregate for SC/ST/PWD candidates). Commencement of Online Application : 16/01/2018. Last Date of Online Application : 14/02/2018. 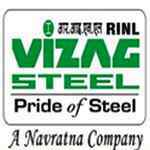 How to Apply: Interested & Eligible Candidates can apply online through http://www.vizagsteel.com from 16th Jan 2018 to 14th Feb 2018..
Rashtriya Ispat Nigam Limited, Vizag Steel Plant, Visakhapatnam has issued notification for the recruitment of 19 posts of Junior Trainee. Interested & eligible candidates can apply online through official website of Vizag Steel Plant. Online Application Process will start from 17/07/2017 and the last date for submission of online application is 31/07/2017. Age Limit as on 01/07/2017. Eligible ITI Trades :- Instrument Mechanic, Electronics, Electronics(Mechanical). Eligible Diploma in Engineering Courses : Diploma in Instrumentation Engineering, Diploma in Electronics & Instrumentation Engineering, Diploma in Electronics Engineering. Diploma in Electronics & Communication Engineering. Application Fee: Rs.300/- (No fee for SC/ST/PWD candidates and Employment Exchange sponsored candidates). Application fee must be deposited in â€œRINL Recruitment Account No. 30589461220â€� at any of the core banking branches of State Bank of India in the prescribed Challan. Commencement of Online Application : 17/07/2017. How to Apply: Interested & eligible candidates can apply online through official website http://www.vizagsteel.com from 17th July 2017 to 31st July 2017. Subscribe our Free Job Alert Mail Service for Vizag Steel Plant Recruitment 2018.